Loved this film with its lush, elaborate, bold, scrumptious plot and script and divine costuming. 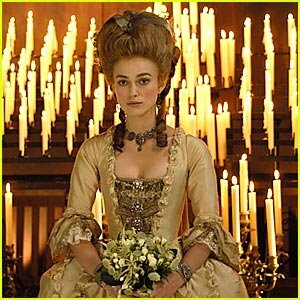 Keira Knightley [Atonement, Pride and Prejudice] does a stellar job as 18th century Duchess of Devonshire, Georgiana [a distant relative to Princess Diana]. At a mere 16-years-old, her parents married her off to the much older Duke of Devonshire, but she was far more interested in politics and sporting events. She liked neither the rules expected of her title nor her boorish husband [the talented Ralph Fiennes [The Reader, The English Patient], quite stuffy in this role]. Not only did her husband ignore her most of the time and make little of her ideas and opinions [she spoke out quite often in mixed company], make demands on her for male heirs [the norm at the time] but he blatantly cheated on her time and again, going so far as having his mistress live in the home with he and the Duchess. After putting up with his affairs for years and “disappointing” him by giving birth to two daughters, she had an affair of her own with an aspiring politician [Dominic Cooper of Mamma Mia!] who later became Prime Minister. The Duke gave her an impossible choice: give up the guy or her children. Despite the strong-willed, independent nature of the Duchess, she remained devoted to her children. The Duchess is a delight– an artful piece of film. This entry was posted on December 30, 2008, 01:56 and is filed under DVD. You can follow any responses to this entry through RSS 2.0. Both comments and pings are currently closed.